I made this tag for the Tim Holtz Compendium of Curiosities 2 - Challenge 3 - Marbled Stains at Studio L3. The sponsor for the challenge this week is Eclectic Paperie - a super online store that I buy from frequently and highly recommend! This technique is described on p.46 and it's very easy and fun to do. To get my marbled stain background I used Spun Sugar, Milled Lavender, Tumbled Glass, Faded Denim and Dusty Concord Distress Stains. I also used Dyan Reaveley Dylusions stamps - Bags of Bunting, Birds on a Wire, and Ruby Rainbow. I thought the background of blues & purples looked like a rainy day sky so I decided to use a "rain" theme. I stamped the raindrops in Memento ink in London Fog. 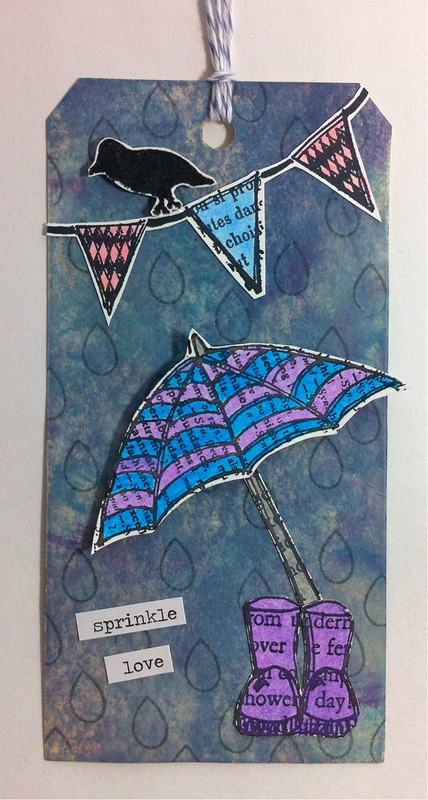 The raindrop is from a Paper Smooches stamp set. The twine is Wisteria Wonder from Stampin' Up. The words are from Tim Holtz Chit Chat. I colored the images with PrismaColor pencils and blended with Gamsol. Thanks for taking a look! What a fabulous tag ... love, love, love this Donna! Barb, can it be a tag for the challenge? What a cute version of the technique. Aren't her stamps so fun! Love these stamps, Donna, and how cool with the raindrops in the BG! Donna, this is positively drool-worthy! What a great approach to the Marbled Stains-- I love the rainy look you created, and the colorful stamped images compliment is perfectly. Every rainy day should make us feel this happy!!! Thanks for sharing this beauty at the CC2C! What a fantastic tag! Love the pop of purple on the blues and the fun fun images! Terrific Tag!! I just love your colour combo & those stamps are perfect, how cool to use raindrops too! It's so neat how you go from one style to the next. I like that. Keep 'em guessing! The blended colors are gorgeous, the rain drops were just right, and those little boots are too cute.